So I'm now a full time Android developer (yay) and one of the things I've had to get used to, is the Gradle build system. I'm a fan of Maven and I still don't truly understand Google's choice to embrace an immature and complex system like Gradle, although admittedly the meta-programming model has some powerful features... but I digress. Having just completed a Gradle plugin at work to solve an in-house tooling problem, I decided to have a go at another tooling aspect I have run into. 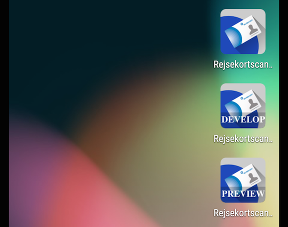 All too often, non-release builds of an application are provided with hideous looking launcher icons or none at all. For high profile products, calling a graphics designer to have an icon made is not that great a cost, but the majority of projects I see lack sorely in this aspect. While not a huge deal, it looks unprofessional and it also super annoying not being able to tell build types apart when testing various builds on the same device. What if we could just auto-generate a labeled launcher icon for the various build types, based on a master release icon? Well now you can, if you use the plugin I wrote.